Cats are creatures of habits who thrive on routine. Most cats will have a set pattern they follow every day. Cats are territorial animals, so their routines will develop around your schedule and your household routines. While such a routine driven life may seem boring to humans, it helps cats feel safe and confident. In fact, routines are so important to cats that having them disrupted can even impact their physical health. A study conducted at the Ohio State University, funded by the National Institutes of Health, looked at how stress affects cats. Of the 32 cats in the study, twelve of the cats were healthy, and twenty had FIC (feline interstitial cystitis), an often painful, inflammatory condition of the bladder and urinary tract. Researchers found that when they changed the cats’ environment or their daily routines, even the healthy cats got sick 1.9 times a week and the others twice a week. Levels returned to normal when the stress had passed. The best way to keep your cats happy and healthy is to keep their routine, and yours, as consistent as possible. If you have to make changes, try to introduce them gradually. Something that may not seem like a big change to you, such as a vacation or a house guest, may be a very big deal to your cat. Allegra and Ruby have their own set routines. They’re pretty good about letting me get up when I’m good and ready, but since I’m usually up by 5:30, that probably helps avoid impatient wake up tactics. After I feed them, I usually spend an hour working, and they take a little after breakfast nap. As soon as I get up from my desk chair, they know it’s playtime, and they both run to the hall closet where our interactive toys are kept. We play for 10-15 minutes, then it’s time for my breakfast, which seems to be their signal that it’s time for some birdwatching. They both have preferred spots: Ruby likes to sit by a downstairs window at ground level, Allegra watches from the top of our cat tree by the sliding glass doors. They seem to know when it’s lunch time, because they start to wake up from their naps a few minutes before I start to stretch and get up (they taught me well!). They know that they get brushed, which is followed by treats, before I prepare my lunch. Then it’s time for an another extended nap. Interestingly, the spots where they nap in the afternoon are driven by weather. On sunny days, they’ll be in my bedroom; Allegra will be on the window napper, Ruby on the bed. On cloudy days, Allegra will nap on the window perch, but Ruby will claim the cable box. By mid-afternoon, they start to get restless. Since I get up so early, dinner is also on the early side, and if I don’t get out of my chair when they think it’s time, they start pacing behind me. Dinner is preceded by another 10-15 minute round of play, and is followed by another long nap. I think one of the reasons I love cats so much is their love of routine. Even though I like to mix things up, I, too, thrive on routine and can be reluctant to change. What is your cat’s daily routine? Share it in a comment! My cat sure loves her routine! We start the day, like we end the night with the cat between my wife and I ensuring no physically activity. I always look forward to waking up with cat hair on me and a tail in my mouth. I go into the living room to get her food while I’m serenaded by a never ending chorus of meows and slight howls, while there is still food in the bowl….. she needs more of course and likes to let me know! So adorable….. luckily I work at home so it’s always a blessing when she lets me know she needs attention, usually when I’m paying bills or on phone, she likes to sit on whatever I’m working on… or jump on my lap and than jump off…. never forgetting to extend her claws so I don’t miss out on the scratch on my unused manhood…. once she knows I’m not busy she sleeps the rest of the day, and waits for my wife to get home so she can all of a sudden be a well behaved cat…. I end the day by having a few drinks passing out on couch, with a few more playful and unsuspecting jumps to the groin throughout the evening.. and at some point turn in while I find her in my spot or cuddling with the wife…. and gives me that long glowing gaze into my eye’s where I can swear I can tell it’s laughing at me..
My cat Zeus LOVES his routine. We wake up around 6:30-7, because thats when I rise, however, he likes to wake me up 30 min before I get up because he’s hungry. Once I am up, he meows like a drug addict to get his breakfast and immediately after, he likes to go out on the patio and watch birds. I usually have coffee and study for a few hours until class, he will come in and out and sit in my lap for 20 min, then back outside for 20 min. During this time, he gets treats and brushed. Then around 10:30 he goes down for a nap. If I am still home, nap place is either right next to me, or in my lap. If I am leaving for classes, he naps on my bed. Its the only dark room in the house. He sleeps the rest of the day until 3-5ish. When he wakes up, its play time. We play and he gets more treats. He usually roams around the house, playing with his turbo track. Around 8, he usually zonks out for a pre-bedtime nap, then when I go to bed, he follows for cuddles. He has come a long way from the scared rescue we found on the street 7 years ago! All of your cats seem to sleep at night…..mine is like having a newborn baby again. I’m literally up 3-4 times a night with her letting her in and out and she’s wanting to play…..please help me get her into your routines I’m shattered!! Thank you. Ill see how tonight goes!! I have to remember that she is only 9 months old so.still a baby really. I’m going to try pushing her dinner time back later. See how.it goes! They certainly are routine-oriented. I have my own little routine–especially during the work week…I leave the house around 8:10am – have my orange juice as my Persian cat has her breakfast, fresh water, etc….I then brush her for a few minutes…get ready for work…watch the morning news…head to work…then go to the gym straight from work–get home around 8/8:30pm…and she greets me at the door, kneads the sisal welcome mat, follows me into the room, rubs against my workbag, they frolics on the bed, gets pet, and we watch TV while I have dinner. I am also a routine person and so is my Simon. Simon was a 3week old feral kitten that I bottle fed. He is very independent and nothing distracts him from his intent except the thrash truck. He’s up by 5:45 and ready to eat. Since he’s an inside/outside cat, he can’t wait to go outside after eating. He’s a hunter and hears the birds calling his name. He loves the outdoors and is very adventurous during the day. So much so I have to look for him if he doesn’t check in every couple of hours. I have had a hard time feeding him “premium” brands because he loves to munch at the neigbors. When 9:30/10pm rolls around, he’s ready to come in get on his blankie and sleep the night away. Ready to do it all over again when morning comes. I too love my routine which somehow overlaps with theirs. 7 year old Charlie demands his dinner when it gets dark so the actual time depends on the time of year. I feed them and myself at the same time. 8 year old Chelsea’s routine is to follow me into the bathroom and sit down next to me, put a paw on my hand and meow to get petted. Both follow me to bed at night where they get a few crunchy treats. Both sleep either on my bed or the sofa but no one wakes me up because I do not feed them or cater to them in the morning. Both greet me at the door when I get home We have no playtime routine but get to it when I’m not busy or tired. And then I seem to be the only one to actually enjoy playing with their toys. If only I could get one of those nanny-cams to see what they do when I’m gone for a night or two. What does this do to their routine? Does anyone do that? If she wants me to go upstairs she runs up the stairs and returns until I follow. That usually means she wants me to nap with her or be on the same level where she wants to nap. She’s not quite a year and very busy. Her markings are much like your cat in the picture that is lying on the floor. She is compact and petite and she is nearly a year, I don’t expect she will get much bigger. I love it when cats make sure their humans go to bed! Minion sounds delightful, Pat. I have a male ocelot/egyptian mau mix with a tailed manx baby girl, both are very vocal in the morning. We are usually up by 7:00 during the week and by 8 or 9 on the weekends. They stay curled up with us at the foot of the bed until I’m out of bed. They know to wait til after the bathroom before they get fed. We give them each a small can of wet food with a 1/4 cup of dry off to the side. Then it’s a bit of play time/pet and love before we have to leave for work. Around 4:30pm When I come home, they headbutt and rub in greeting, usually meowing for attention. Then it’s playtime followed by catnip on the scratching post to keep them entertained for a few hours. By 9:00pm they get a little more dry to get them through the night and they lay curled up on us after dinner. By 10:00pm, we’re in bed and they are at our feet. Your two sound so well behaved, Nicole! I don’t know of too many cats who actually let their guardians sleep in on weekends. My first Persian and my current calico Persian, both let me sleep in! Not one peep out of either of them. Amazing. Lucky owner I suppose. While I understand that cats thrive on routine, I find it difficult to maintain consistency. I am a nurse. I work 12 hour shifts. Sometimes it’s day shift. Sometimes it’s night shift. Mostly it’s mid – shift, 11 am to 11 pm. 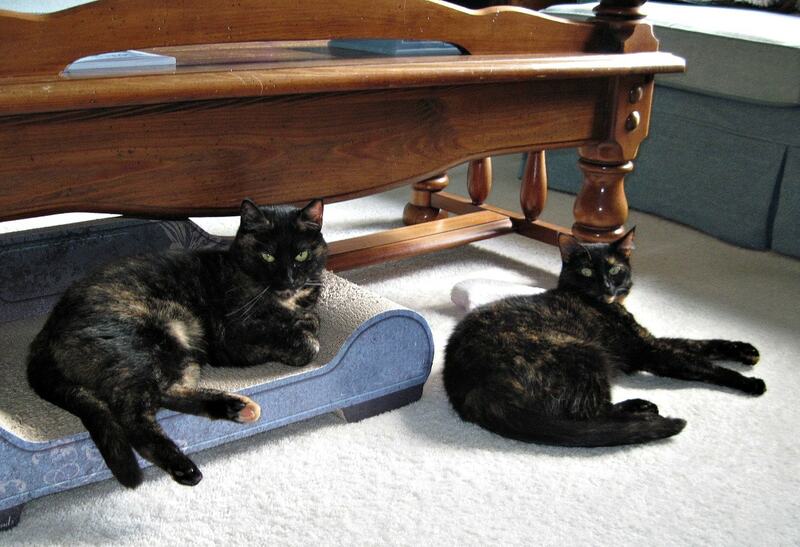 I have 2 spayed female cats who seem adaptable, but I do worry about their lack of routine. Mine our used to routine too as someone is always home. I have 2 kitties that need playtime with my son every morning and others will play with me. For some reason only he can play right with those too. LOL. Sort of like a special bond. That’s so cute that your kitties have favorites when it comes to playtime, Sue. Yesterday, I had to leave the house really early for a company function, and did not get the litter boxes scooped like I usually do. When I awake in the morning, I use the bathroom, then scoop the boxes! When I finally made it home and ate dinner, Chuck was yowling and even food didn’t quiet him. The light-bulb went off over my head, and I scooped all the boxes right then. Chuck quieted, used the freshly policed facilities, and all was right with the world again! Y’all are going to think this is weird, but I rather enjoy this chore. Okay, it doesn’t always smell terrific, but I love my kitties so much that I really, REALLY want them to have the best I can give. And scooping daily, and at the same time each day, is one of those routines that keep them healthy and happy. And me too! Boy, Chuck sure let you know he wasn’t pleased! My cats know that when I get up and come home, it’s feeding time! And as I’m leaving the house, play time! Lol. I’m just lucky my house isn’t in shambles when I come home! I’m planning on shifting my cat from India to Dubai as I’ve also moved here recently. Will that affect my cats health? She is a year old now. Both we and our girlies are creatures of habit and routine. We get up early (around 5:30am) and Faith follows me about the house with head-buts while I do a few morning time things whilst Britney hides in the bathroom with Stu to have ‘secret biscuits’ before breakfast. As she has renal disease and drinks a lot of water, the volume of water on an empty tum makes her sick, so we’ve found this works well to stop her sickness. Then I make their breakfast of wet food, but before I give it to them, this is when I brush their teeth and give any medications… So that they associate the reward with breakfast straight after. Then it’s make Stu’s lunch and clean up. Girlies then settle for a while and then have attention and play time before a snack and their morning nap… Which can be anywhere… But Faith tends to like to be somewhere fairly close to Britney. They will have small lunch time snack and then sleep for the afternoon. They too get fairly restless come dinner time in the evening, I can almost set a clock by it. They will both play for a little while and then have their other main wet food meal. Britney will then go somewhere quiet for the evening and Faith will settle dependent on where I (or primarily my lap is). Then just before bed they will have a little super and tickles before they settle down to sleep with us. Faith likes to be the last to get on the bed at night… I think she likes to make sure everyone else is settled. Faith watches birds/wildlife out of the window before we get up and in the mornings between breakfast and nap time. Britney used to too, but less so now she’s older and prefers a nice warm spot to sleep . As much as possible, we stick to our routine and it’s generally easy to since I don’t leave the house. Having said that, when we do have to change for any reason (like this morning I have to collect a urine sample from Britney so I’m camping out near the tray… Which to them looks like a very odd behaviour… But it’s quiet a covert operation!!! Thanks for sharing your girls’ routines, Jennie! The only time our cats’ routine is upset is on vet day. They really hate that! That would definitely count as upsetting their routine!